We've been sending one another postcards for well over a century now - usually brief messages to our friends and family telling them about the weather on our holidays or where we're visiting next on our travels. A hundred years ago we sent postcards with more serious messages - important, personal information about births, marriages and deaths, urgent requests for help, or just to keep in touch before the use of the telephone became widespread. The choice of subjects featured on postcards today is vast, but amongst the most popular has always been the lighthouse - a symbol of safety and reliability, and evidence of Man's basic instinct to warn and reassure. Over the years, almost every British lighthouse has featured on a postcard of some description, and the ones with easy access are regularly updated with different views. 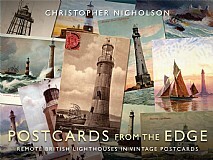 This new book from Christopher Nicholson, author of the highly-acclaimed Rock Lighthouses of Britain, concentrates on vintage postcards featuring the remotest lighthouses of all. Within these pages are snapshots of the past and moments in time from the very edge of Britain - granite pillars rising from sea-swept reefs or the lights on uninhabited storm-lashed islets dotted around the coasts of England, Wales and Scotland. Some of these cards are artists' impressions, some are hand-tinted, while others are real sepia or black and white photographs - but they all show how things used to look and how life used to be at the very extremes of offshore Britain. Due to their age these postcards are now valuable documents of social history - keepers posing with their families or being relieved at the end of their stint of duty - and they also illustrate the changing appearance of the lighthouses, together with the appalling weather the keepers endured. Proof, if such were needed, that there was nowhere too isolated nor weather too rough that would daunt the determined postcard photographer! It was perhaps because of the very remoteness of the lighthouses that drew people to buy the postcards and these evocative photographs will invoke an appreciation of those bygone times. With chapters on 'pillar lights', 'island lights', 'relief days', 'wild winds and white water' and 'curiosities' the author has been given unique access to the collections of private individuals and lighthouse authorities to compile a fascinating and nostalgic work. Each lighthouse featured is accompanied by interesting historical details as well as a selection of vintage postcard views with extended captions - some over a century old. This is an engaging mix that's sure to appeal to all lighthouse enthusiasts and all those interested in maritime engineering, early photography and social history. It will also be of great general appeal and ideal for dipping into for a nostalgic read about individual lighthouses.